In my last blog post I shared a shapefile with the current UK constituency boundaries, which included a lot of other data. One of the variables included was who came second in the 2015 UK General Election. I thought it would be interesting to map this and also include a couple of widgets using the new Builder tools in CARTO (formerly CartoDB). I wanted to do this because I knew UKIP came second in 120 constituencies and I wanted to see where. I also wanted to post an interactive version of the data from my shapefile so people could explore it themselves. 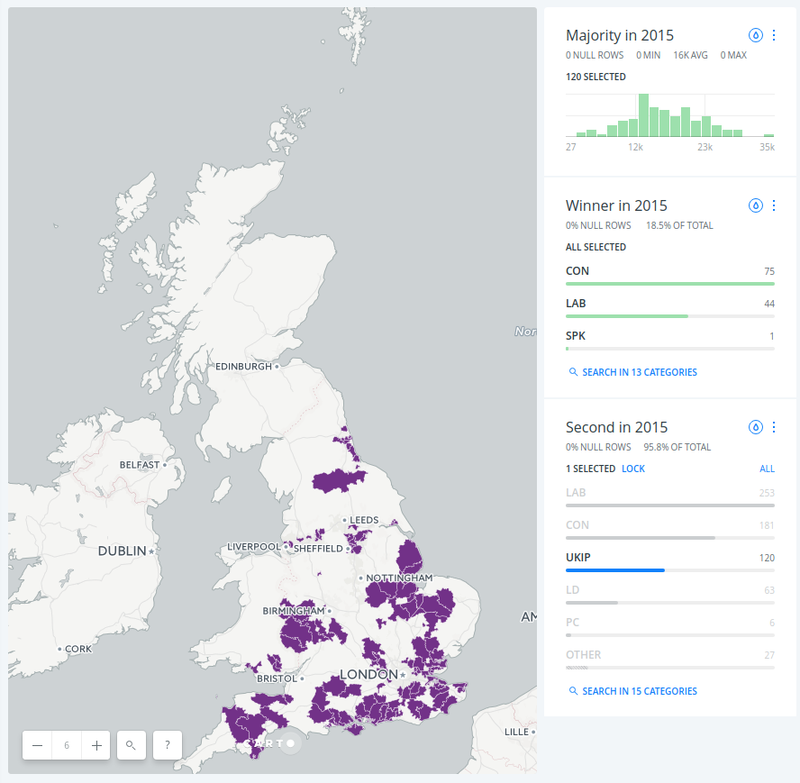 The first map below shows who came second in each constituency in 2015 and if you click an area you'll get more information - winner, MP, and so on. 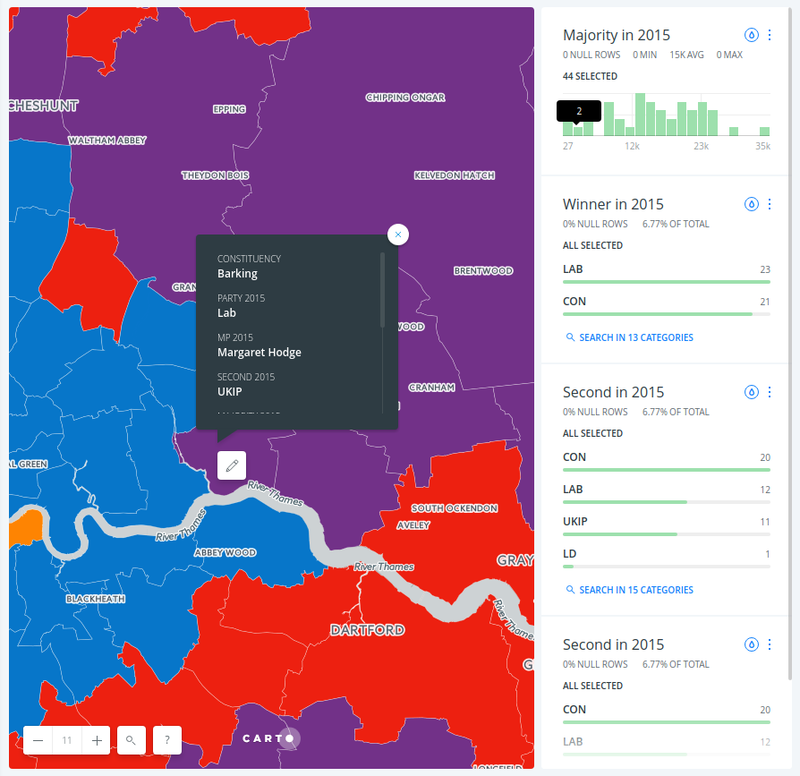 Using the widgets below you can then select by winning party and margin of victory, should you want to quickly identify marginal seats, for example. In the next map, I've used the 'Majority in 2015' widget to select only those areas with a majority of 3,000 or less and this then updates the 'Winner in 2015' widget so that you can see 41 of these constituencies voted Labour in 2015 and 36 were Conservative. 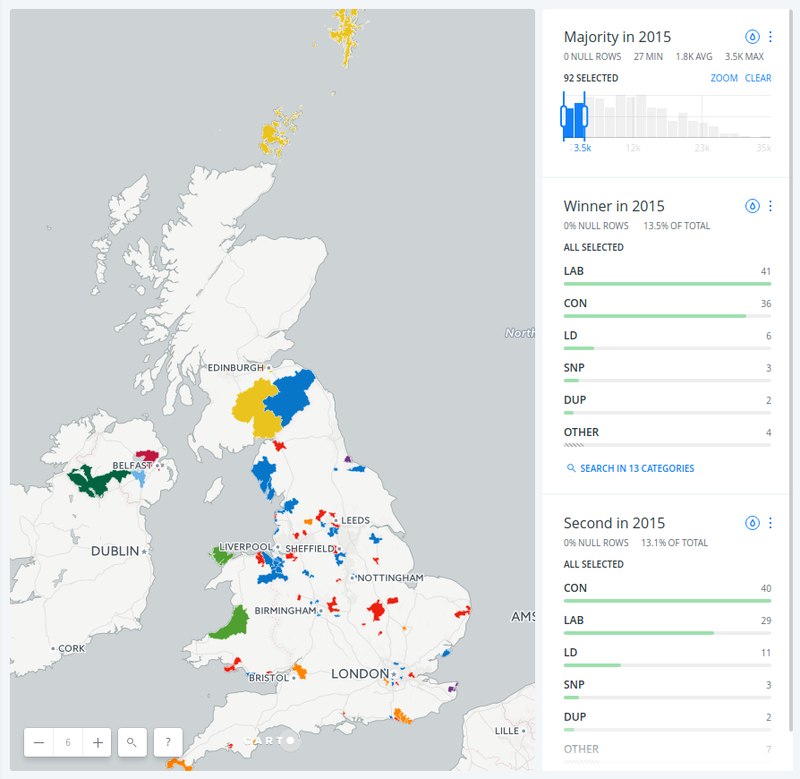 At the other end of the scale, I then used the widget slider to select all those constituencies in 2015 which had a majority of 15,000 or more. The final map below shows this. 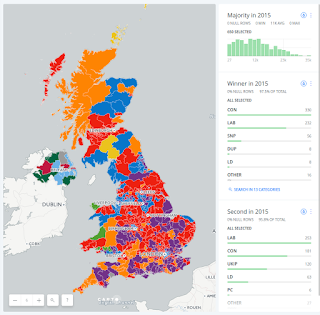 As you can see, 153 of these were Conservative constituencies and 59 were Labour. The colours on the map - remember - are who came second in 2015. So is this a 'no chance of winning here' map? Possibly. I wouldn't be holding out for any shocks though. 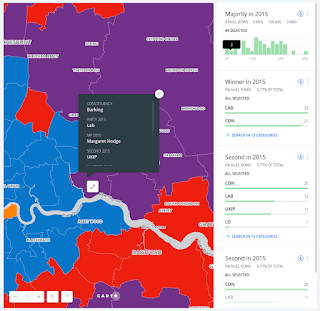 Here's what the map looks like when you show Labour, Conservative and then UKIP second place finishes. I didn't make this so that I could comment on it so have a go yourself in the full screen version.